Place water in the bottom of a double boiler and bring to a boil. Meanwhile, chop the chocolate into large chunks. 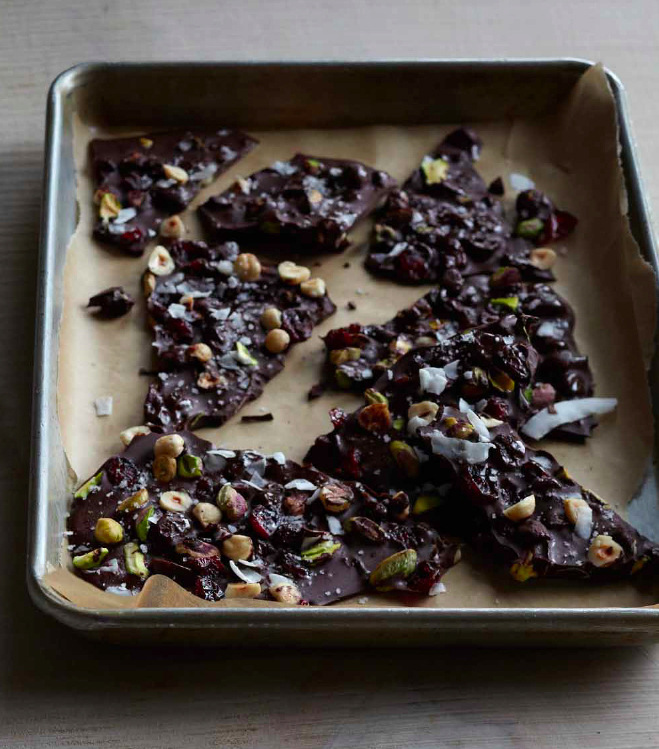 Set aside one tablespoon each of the pistachios, hazelnuts, cherries and coconut. Place a silpat mat or piece of parchment paper on a baking sheet; reserve. Melt the chocolate in the top of the double boiler. Once the chocolate is completely smooth, turn off the heat and stir in the nuts, cherries and coconut. Pour the chocolate mixture onto the reserved silpat mat, spreading out with a spatula to approximately an 8-x 10-inch rectangle. Sprinkle the reserved nuts, cherries and coconut evenly on top. Sprinkle the salt over the chocolate. Transfer the baking sheet to the freezer and freeze for 1 hour, until completely firm. Using clean hands, break the chocolate into chunks and enjoy, or transfer to a sealed container for later. Store in the freezer for best results.